Widmer 776TV Ink Seal Embosser - New Phoenix Inc. NOTE: The Model 776TV prints a seal, date, signature and title. 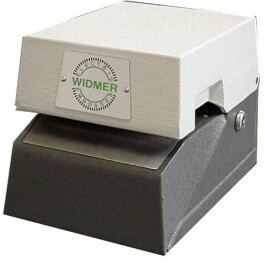 The Widmer Model 776TV Ink Seal creates a printed seal into a document and prints a combination of signature, title, date and additional text—all in one easy step! Signature and text may be printed in single or tri-colored ink. The print/emboss trigger is paper activated—no buttons to push or levers to pull. Iron cast upper and lower casing insures stability and long life. Two-tone light and dark gray finish. 115 Volt 60Hz (Optional 220 Volt 50Hz). Inscriptions may be above, or below the time, date and number line.